Please click here for the walkthrough. review: And the culprit is... Mr. Mingles! No, seriously. But let’s not jump the gun... or the bomb, as is the case this time. 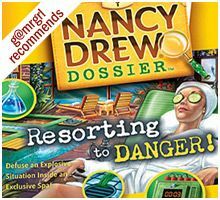 The latest Nancy Drew game by Her Interactive starts with a bomb blast at the posh Redondo Centre for Rehabilitation in Northern California, one in a series of many that has Manager Nick Bleski worried even as he assures his privileged guests that the blasts are ‘construction accidents’. Teen sleuth Nancy is requested to investigate, and she promptly visits the Centre, armed with her formidable skills and a bomb-detecting device built by her gal-pal George Fayne, which is expected to ‘almost certainly work’. She is met by Cassidy Jones, the hoity-toity receptionist at the Centre, who starts the tutorial that demonstrates the various aspects of the game. The instructions are clear, easy to understand and remember, and get the story going while showing the ropes. Nancy goes undercover as a General Assistant, and must do various tasks ordered by the Centre’s visitors and employees in addition to her detective work. Her dual role, combined with the out-of-control antics of pampered pooch Mr. Mingles, easily takes the game to an averagely-challenging but thoroughly-entertaining 15+ hours of hidden object hunts, jigsaws, arcade puzzles, mini-quizzes and a step-by-step unravelling of the whodunit. The screens - the rooms and garden of the Centre - are drawn in comic book style: 2-D, vibrant and detailed. The hidden objects are all relevant to the case, often forming parts of inventory puzzles, and appear in multiple layers i.e. at different times of the game serving different purposes. 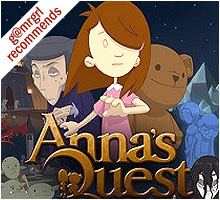 The arcade puzzles – which have detailed tutorials and increase in difficulty / complexity as the game progresses, cover jumbled words, match twos / threes, pipes-based alignment games and a seemingly girly but deceptively tricky game where Nancy has to give ‘facials’ to the residents of the Centre. Chats with characters and navigating the Centre require Nancy to answer questions that test her grasp of the case. There are some logical puzzles as well, including an interesting one involving a Chinese carving and matching marbles, and a long, complex and slightly vague romp around the garden hedge maze fixing the statues of Greek gods, goddesses and philosophers that may require one or two peeks at Google or Wikipedia. The characters, represented as toons, have distinct personality quirks and expressions, and add considerable charm to the game. Besides uber-professional Bleski and dandy Cassidy, there is super-rich, super-neurotic Mrs. Montague, the owner of Mr. Mingles; silky-voiced, breezy diva Jasmine Ivy; frustrated and blustering biochemist Helfdan Helgason; and the creepy janitor Joanna Brown. Each of them has secrets and agendas and is a suspect at some or all points of the game. In fact, the game is designed to have six different endings depending on how it's played – yes, that’s right! Besides adding replay value, this fact also stands testament to the tight storytelling that is the hallmark of the Nancy Drew games. The game has many tools to aid Nancy’s quest, such as a journal detailing the chapters, a hints system and in-game clues and descriptions that nudge the player towards the solution. A points system called the Krolmeister Sleutho-Meter leads to detective rankings starting from Amateur and ending at Ultimate Private Eye, achieving which rewards the player with the ‘Special Credits’. As a bonus, the arcade puzzles appear as stand-alone games along with the main adventure. 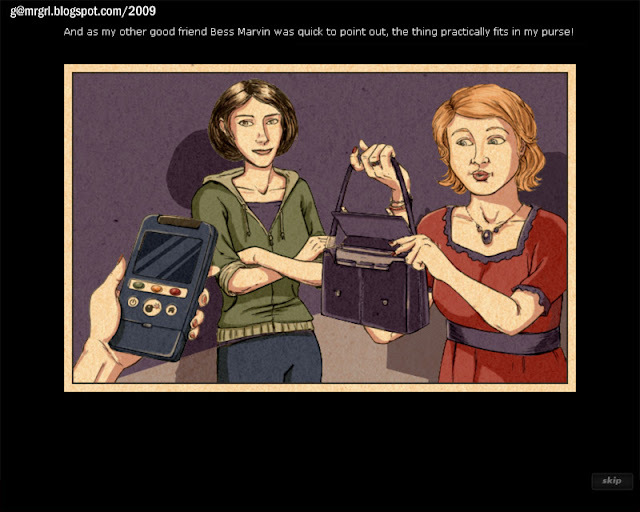 Her Interactive steps away from long-format adventures to the currently popular casual-HOG-adventure format for this title, part of the ‘Nancy Drew Dossier’ series. This makes the game easier and linear, with one screen leading to another, and nothing to be ‘deduced’ as such. 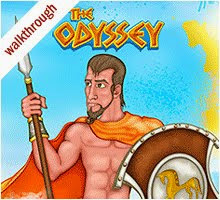 Players used to the demanding long adventures may find this a bit of a walkover, and may even be mildly turned off by the arcade puzzles that cannot be skipped (but can be attempted over and over again). 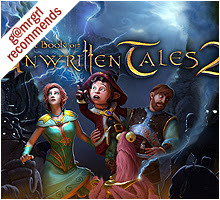 But by retaining the features that set these games apart from run-of-the-mill offerings - a robust storyline, perfect voiceovers (the same team that does the long-format games), music that is suitably moody and urgent, and extreme and intelligent attention to detail – Her Interactive makes this game a must-play for existing fans, and will certainly entice a new set of fans, who may be intimated by ‘serious adventures’, to be part of Nancy's cases and enjoy the talent and charisma that has enthralled many generations of mystery buffs. And as they say, the more the merrier! This is an original review written by me. Please do not distribute / adapt the text and images in any way without my written consent. review: Cake Mania returns with its fourth instalment – Main Street, bringing back Jill Evans, who makes the best cakes in the universe, her husband Jack, and her friends Risha, the city girl, and Tiny, the ex-sumo wrestler. As usual, an upstart mall, Baker’s Corner, has run out the quaint mom-and-pop shops from Bakersfield’s Main Street, which leads to the setup of Operation OSDBFRBRMSATAWSSCFBC - umm, yes. That’s “Operation Save Downtown Bakersfield From Ruin By Revitalising Main Street and Attracting Tourists, All While Secretly Stealing Customers From Baker’s Corner”, which sums up the aim of the game. So, getting on with that noble mission, we start with the Grand Reopening of the Evans Bakery. The game format remains the same - Jill serving her clients with cakes, frostings and toppings. She takes orders by phone too, though each level rarely logs more than one call. But thereafter the game breaks away from the confines of its name, and allows the player to purchase, upgrade and run three more types of shops: Jack’s Burger Barn, Risha’s Flower Shop and Sumo’s Sushi. Each shop has 25 levels, adding up to a 100 crazy levels of running around baking cakes, making burgers, selling bouquets and wrapping sushi. This is as good as offers get – four for the price of one! The Flower Shop follows the same format as the Bakery, replacing cakes with bouquets loaded with wrappings, ribbons and knick-knacks. 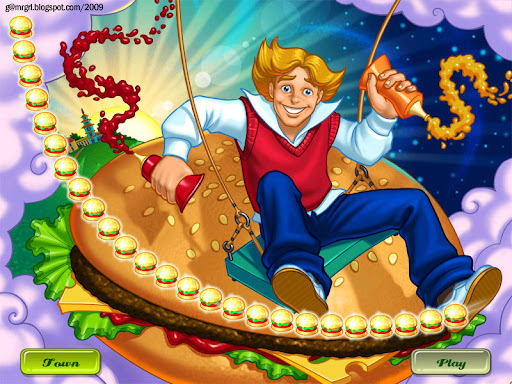 Burger Barn and Sumo’s Sushi have a different format – the player is ‘behind the table’ making the dishes, similar to 2007's Burger Island. A map of Bakersfield shows the position and condition of the shops, the town’s attractions, and the number of tourists. Each shop has a daily income, which accumulates to allow purchase of shop improvements, which in turn increases its daily income. Half of all daily earnings from the shops go to the town, which is used to build attractions like the Bakersfield Arch, the Giant Ferris Wheel-O-Fun and fountains and statues for the benefit of tourists (and of course, the town). Trophies are awarded for completing various milestones of the game. 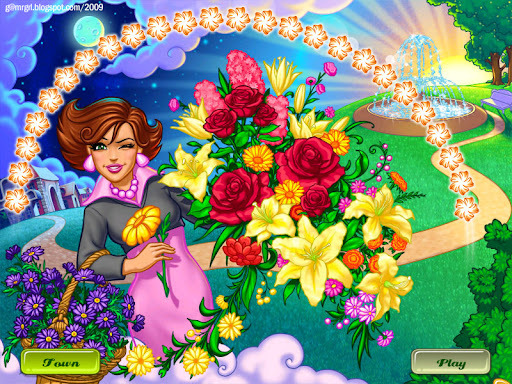 After each successful level, the Bakery and Flower Shop allow purchase and resale of equipment and upgrades. 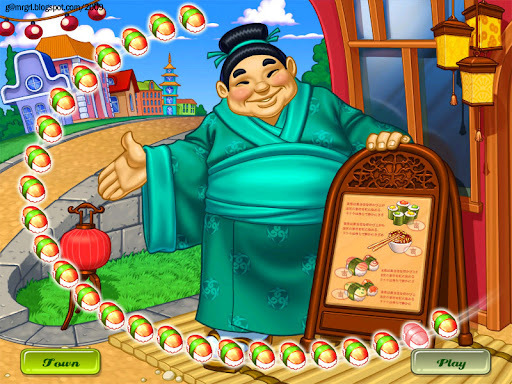 The Burger Barn and Sumo’s Sushi allow purchase of new recipes (a vast collection) and two items, both for pacifying customers. The clientele ranges from aliens to vampires to pirates and sundry corny types, including a spaced-out hippy who wants tacos but can be sold, well, ANYTHING. Some clients affect other clients either to the gamers’ advantage or against – Super-Matt freezes his neighbours, ninjas black them out, mafia-man steals money, vampires turn others into vampires, and an arrogant chef turns patrons into hot dogs, changing their orders, often leading to massive wastage, and consequently, negative marking. It’s not really a bad thing - it makes an otherwise standard game unpredictable and challenging. A big annoyance for me was that Jill and Risha carry only one item at a time, which resulted in a LOT of walking back and forth, reducing productivity, tiring the eyes, and being boring in general. Burger Barn and Sumo’s Sushi are super-efficient though: there’s no unnecessary movement, wrong ingredients cannot be added and fried things don’t get burned, so there’s zero wastage. 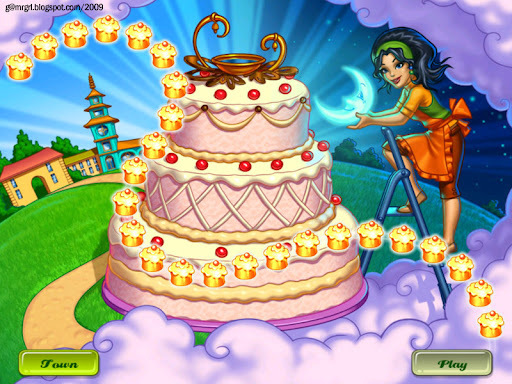 Cake Mania starts each shop segment with tutorials that are simple to grasp even for first-timers either to the series, or the genre. The game is easy too: 99 levels took me only one attempt to reach the goal, and never more than 2 – 3 attempts to reach Superstar for the (surprisingly few) demanding levels. Level 24 of Sumo’s Sushi remained unconquered: despite 10 retries, I failed to get past 1700-odd versus a Superstar target of 2000. But overall, it’s fun without frustration, and full marks for keeping it that way. The art is average: the comic book format is common, the intro screens are gaudy, and the actual game screens have nothing new to offer. The music is average too; mostly up-tempo beats thumping up the urgency, except for the cringe-inducing electronica-oriental theme of Sumo’s Sushi. The game has many voice-overs, and while stereotypical, these did make the intro segments more interesting. One thing that grated on my nerves – and this seems to be a trend across time management games nowadays – is the ‘big is bad and hostile, small is sweet and all heart’ message that kept getting pounded across. Maybe because I’m a city girl through-and-through, never having lived in a small town, I disagree with this regressive anti-mall, anti-retail chain, anti-multiplex, anti-big hotel, anti-organised sector philosophy. While I’m sure market research supports following through with this theme again and again, I find it alarming that gamers today, especially girls who are a key audience, are in favour of this in-your-face back to the basics propaganda, which, frankly, is in complete contradiction to the reality. Jill is ambitious enough to take on a large shopping mall and beat it to the ground. She buys shops and entertainment venues across town, builds her own statue as a tourist attraction, rakes in the moolah selling new and improved items from level to level, and yet remains aggressively derisive of the very quality she displays in achieving her goal – sheer business acumen that identifies and capitalises on money-making opportunities. Is there really any difference between the ultimate aim of a mom-and-pop shop and the biggest retail chains? The game tries to get us familiar with Jill’s friends too. Jack is sweet and affectionate but daft. Risha is smart and no-nonsense, and brings most of the humour to the game with her snarky remarks. Tiny’s saga is tragic and bizarre in equal parts – an Octozilla (mutant octopus) drowned his village and he was forced to become a sumo wrestler to make ends meet, and then he defeated someone, who is now hunting him down via ninjas. All this has unfortunately but expectedly scrambled his brains and he now revels in romantic matches between shrimps and crabs and squids, all the while nursing a deathly fear of fugu (wikipedia), a dish made from the poisonous pufferfish. Then there’s this unnecessary track of Jill’s hinted-at pregnancy, covering the entire gamut of side-effects from morning sickness to mood swings to craving for strange foods. Unnecessary, because till the end she displays no baby-bump, Jack remains absurdly clueless, and there is no update on the situation in the final wrap-up. I suppose we’ll see in Episode 5. 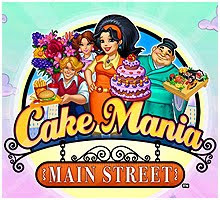 I was honestly disappointed that Cake Mania: Main Street did not endeavour to break any new ground in terms of game-play or storylines or production values, given that it’s one of the leaders of the genre and hence lends itself to big expectations. It’s a quick, formula package – a product of the suited-up retail business the game ironically keeps bashing, and lacks the much-touted heart. PS: Cake Mobile offers the option to play the game on the cell-phone, taking a step forward in techno-terms, but I remain old-school for now. review: Calling this game ‘casual’ or even a ‘hidden object game’ borders on criminal understatement; it is by far the most activity-packed, logically-sound, graphically brilliant game I’ve played in this genre. TSII blows away the competition of the formula HOG-adventures flooding the market, romping home with a 5/5 for: solid storylines from start to end, overall and chapter-wise; complete relevancy of hidden items to their situations; puzzles that are diverse in both design and difficulty and yet tightly integrated with the story; extremely-detailed, spectacular screens and special effects; and smooth, bug-free, typo-free development. 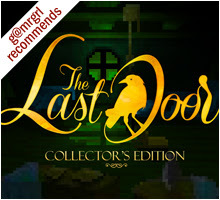 It is the longest game I’ve played in this genre: given that the game is super-intuitive and each task / puzzle leads directly to the next, it still offers 15-20 hours of pure game-play that constantly challenges. There are literally hundreds of things to do, and amazingly, none of it involves bleary-eyed screen-gazing for staplers in ancient Egypt. 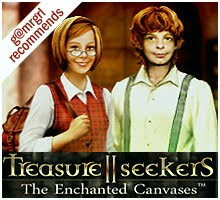 The game is a sequel to Treasure Seekers – Visions of Gold, which I’ve unfortunately not played yet. This edition starts when young adventurer Nelly gets a letter from her brother Tom, asking her to join him at Totenkraft Castle to discover the Philosopher’s Stone, the coveted elixir of life. Nelly takes the next train to the Romanian castle, but Tom is missing by the time she reaches, and she is confronted by a wall with mysterious, enchanted paintings instead. Thereafter Nelly must explore the 6 paintings, each of which is a gateway to locations ranging from desolate fishing villages to magical castles and dangerous forests. There, she has to save various unfortunate entities – ghosts, werewolves and genies - to discover Tom’s fate, and possibly, the Stone. The game is primarily hidden object retrieval, but it stays firmly away from the laundry lists of generic clipart that ail this genre. Each screen packs several quest items which are activated at different times as parts of different tasks. The items are intelligently integrated into the screens – relevant, yet distinct. The screens aren’t flat backgrounds - they have ‘depth’ and changes to items and scenario elements persist, and often aid, following tasks. This superior level of interactivity elevates the game from being a HOG to being, well, an adventure game. Nelly’s journey is interspersed with mini-games covering virtually every type of puzzle from jigsaws to match-objects/patterns to logical/spatial/numerical exercises. These blend well into the storyline – a pipe game to fix a jammed water wheel, for example, or catching fireflies that had once been just ‘beautiful scenery’. There is a fair amount of simple inventory action spanning multiple screens. The game provides a broad Task List which helps in case the next to-do is unclear. There are two game-play modes – Casual and Advanced. The Casual mode has ‘Hint’ and ‘Skip Puzzle’ charging faster, and quicker illumination of the next collectable item (not sure what this means, the game says so). The Advanced mode is for expert players. Playing Advanced, I used Hint only thrice, each time because I was in a rush, not because anything was unclear. Skip Puzzle in Advanced takes a couple of minutes to load, so it’s not a drag; there’s no point playing this game unless one intends to spend a minute or two trying to solve a puzzle. I finished most puzzles in under two minutes, and had no need to skip any even without external walkthroughs. The art is fantastic. Each segment starts with a well-drawn mini-movie. The 50-odd unique screens each have subtle, realistic effects like creeping insects, fluttering candlelight, drizzling water, swaying leaves, etc. And then there are the spectacular special effects, like the lighting of the Hell’s Eye magnifying glass, the swaying of the ship en-route to the Storm Temple, the release of the ghost from Vampire Castle, and the revelation of each of the five gems in the last level, to name a few. And let’s not forget the day / night concept in the Vampire Woods: novel, yet tightly worked into the story. The music and sound effects support the art perfectly, building ambience without jarring, and have their own subtle moments, like the vampire’s retro mood music and the seriously creepy, mad banging of the hold in the fisherman’s hut, revealing... well, open to find out! Nelly as a heroine is intelligent and considerate, and firm with her antsy supporting cast. Tom has little to contribute, and hopefully we’ll see more of him in the next part. Speaking of which, I cannot wait! PS: A shoutout to the Artogon dev team for the cute Easter Egg of their smiley-logo revealed by the Hell’s Eye in the morbid rustic church – it was definitely the ‘awww’ moment of this cool, cool game. Reviews and walkthroughs of classic and casual adventure games (PC) that I've played. 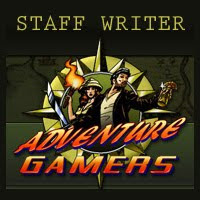 I'm not a professional gamer, and have no link to the gaming industry beyond my pro bono reviews for Adventure Gamers. All my content is original, except game briefs taken from official websites. I only play and review games that suit my interests, and the views are all mine. I post walkthroughs only of games for which I didn't consult external walkthroughs. My notes illustrate the way I personally navigated a game. 2009 - 2019 trIdea, India and/or adventuregamers.com. Powered by Blogger.